The ChargeMaster 12/35-3, 12/50-3, 24/20-3 and 24/30-3 are equipped with simple alarms using LEDs on the front panels. Above models are protected against overload, short circuit, over heating and under and over voltage. 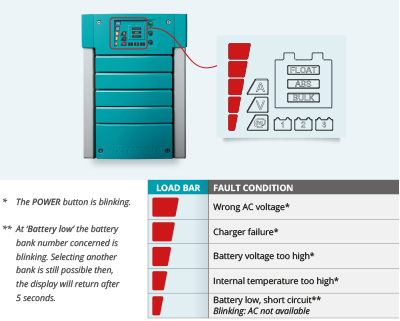 If a fault condition occurs, a load bar segment on the display illuminates red. The LED position indicates the failure cause. 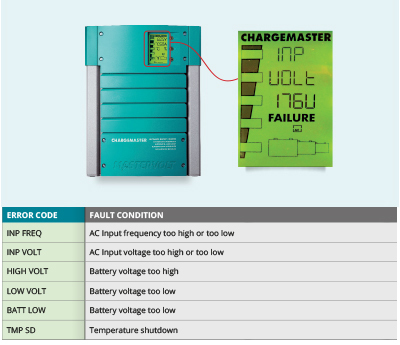 The larger models such as the ChargeMaster 12/70-3, 12/100-3, 24/40-3, 24/60-3, 24/80-3 and 24/100-3, use the digital front panel of the battery charger for error notifications. Should an error occur, FAILURE is shown on the display. The origin of the error is displayed by means of an error code. In general, error codes indicate problems with the wiring, fuses or a poor grid quality. Check these thoroughly before contacting your installer or supplier.